Japanese Episode AG 032: "Suterare Fune! Shinobiyoru Kage!" American Episode 304: "Abandon Ship!" Satoshi and the gang have decided to head toward the next gym, which happens to be in Kinsetsu City. 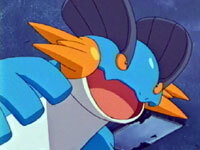 On the way, however, they've decided to pass by Kaina City to allow Haruka to compete in the Pokemon Contest there. The group is on a small motorboat taking them to the city until the pilots of the boat reveal themselves to be Musashi and Kojirou! After they're defeated, the gang is left to run the small boat on their own, which promptly runs out of gas. Satoshi and his friends drift toward an abandoned ship, where a trainer named Hiromi is searching for his Numaclaw. As the gang searches, they are abducted one by one by a mysterious figure. Before too long, the abductor is revealed to be Laglarge, who Hiromi deduces used to be his Numaclaw. The pokemon thinks that its trainer had abandoned it, but after a memory-jogging flashback the pokemon becomes friendly again. Hiromi thanks Satoshi and his friends for their help and offers to take them to Kaina City with the motorboat he used to get to the abandoned ship. The gang arrives in Kaina City soon, ready for the next challenge. We're finally finished with Touki's Gym Battle, so now we get this sort of transition episode between Muro Island and Kaina City. I personally liked this episode better than "Sharpedo Attack!" because of the way the various characters interacted, especially Nyasu and Masato. While Numaclaw's role in this episode wasn't all that great, I did enjoy what little of the pokemon we did get to see, and I hope that we'll get to see the little pokemon again sometime in the future. The dubbed version actually has some edits to talk about, so this comparison won't be as boring as the last few have been. In the Japanese version, the opening shot of the episode was a shot that panned down to the boat. In the dub, the actual panning of the camera is cut. The badge case wasn't edited for Canada, the UK, Australia, or anywhere else in the world. 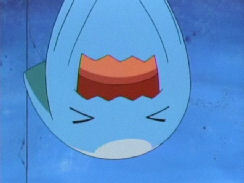 A three-second shot of Sonansu hanging upside down after it gets captured by Itomaru (before Jessie's "And you are absolutely useless!") is cut. It falls right after the Japanese commercial break, so I'm guessing that 4Kids cut it to avoid having the pokemon say its name two times in a row. 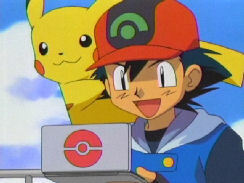 May: "I can't wait for my Pokemon Contest! I'm so excited!" 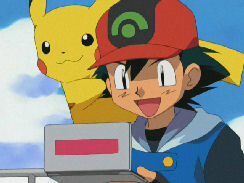 Ash: "Me too! Slateport City Gym, here I come!" There is no Pokemon Gym in Slateport City. You're going to Slateport City to let May participate in the Pokemon Contest, and then you're going to Mauville City to have your gym match. You know, like you said in the beginning of this episode? Originally, Satoshi states that he'll do his best in his upcoming Gym Battle.